Iron deficiency in plants causes slow growth rates, poor color for green and red plants and overall poor health. 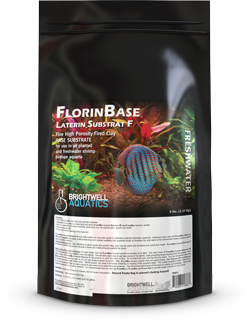 FlorinBase Laterin Substrat F is ideal for planted aquariums because it stores and makes minerals available for plants. For best results, first use FlorinBase Laterite powder as directed on its label. Then add a layer of FlorinBase Laterin Substrat VF very fine granules to completely cover the laterite. This will allow plant roots to get easy access to the laterite, while preventing excess clouding from the laterite. Next add a layer of FlorinBase Laterin Substrat F, this product, to cover the entire surface. Do not blend this layer with the first two layers. You can now either allow the Substrat F to be your top layer or you can add whatever gravel you prefer. Note: FlorinBase Laterite powder does not require rinsing. Both Substrat VF and Substrat F should be rinsed well before using. Laterite powder can cause a temporary reddening or clouding of the aquarium water. This usually dissipates within a few hours. It is recommended that you use a saucer to pour water on to when filling the aquarium. This will prevent disturbance of the layers of Laterite and substrate. Plants also require potassium and other nutrients. It is recommended that you also use FlorinMulti, FlorinGrō and Florin Axis to provide proper nutrition to your plants.